Samsung Galaxy S4 press conference called for March the 14th! So it seems Samsung are busy little bees at the moment, what with their presence at MWC where they've already shown off their Homesync and announced that they're merging Bada and Tizen. Now though is we've got details on what you've really been waiting for! 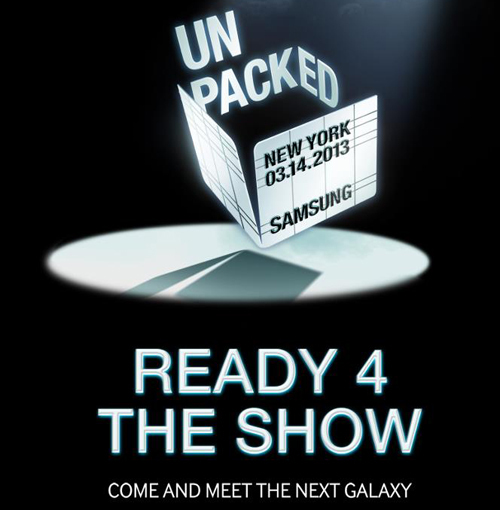 Samsung have confirmed that their 'Unpacked' announcement will happen on March the 14th this year over in New York! As you can see from the invite above Samsung will be introducing 'the next Galaxy' and for those of you who missed it there is the number 4 posted up in plain sight, so that should help alleviate the debate about what the Galaxy S4 will be called! Thankfully for those of us who can't make the day there will be a livestream at www.youtube.com/SamsungMobile!